“Blood is the most precious gift that anyone can give to another person – the gift of life.” states Steve Pignataro, BCP Donor Representative. “We are grateful for 5 Star Car Wash’s continued support and dedication. Through our partnership, 350 lifesaving units of blood have been donated.” Please join us at the July blood drive. 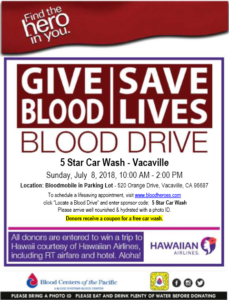 Appointments: To schedule an appointment, visit www.bloodheroes.com, click “Locate a Blood Drive” and enter Sponsor Code: 5 Star Car Wash or call Steve at 707.230.0689 Promotion: Donors will receive a coupon for a free car wash.
5 star car wash and detail center, Blood Centers of the Pacific. Bookmark.